We formed a crew of three frontend developers: Vanja Devcic, Hrvoje Jurisic and Filip Svetlicic plus me as a car driver and hit the road to a small place called Hallbergmoos. 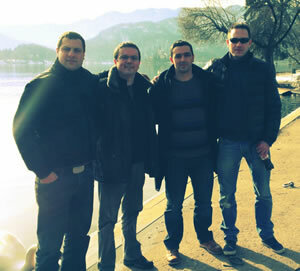 In Slovenia, we stopped at the most popular tourist destination – Bled. Known primarily for its beautiful lake, incredible castle, and position in the Julian Alps, the town of Bled itself is slightly underwhelming. We fed a few swans there on the lake, but we didn’t have much time to climb all the way to castle. We arrived to Hallbergmoos late that night and saw the most interesting item ever at reception desk. That night, we had a few beers hoping it will not be too much for the exam tomorrow. The exam was exhausting. In this beta testing session, candidates needed to answer almost 200 questions in 4 hours. To make a comparison, final test now has 65 questions and lasts for 90 minutes. After the exam, we used that afternoon to visit Munich and drink some more beers there. Wind was blowing like crazy, so there was not a great sightseeing day. You get it, we had to drink some more. We also had a chance to see one of the weirdest looking church interiors. Unfortunately, Filip from the three didn’t get a passing score, but he was very close since he had very similar number of positive answers as Vanja. With the next voucher, we are sure he will get to the list. With writing this article, I asked Vanja and Hrvoje couple of questions. Vanja, was the majority of questions from practice or theory? Do you feel a senior Magento frontend developer can pass the test without going through the study guide? Majority was definitely from practice. Magento, in depth, can only be learned by practice and experience. I feel that senior Magento frontend developer could pass the test without going through the study guide, which covers theoretical questions the most, like Magentos fallback system, but it is practical very hard or even impossible to pass the test only with learning from study guide and not to have or to have little real experience with Magento code. Hrvoje, did the test cover important Magento areas for frontend developer? Did something there surprise you? Do you need to know PHP or ZEND to pass it? Inchoo is a Magento 2 Trained Solution Partner! Hey guys, congrats on your achievement. I finished my Dev+ exam in February and was asked if I’d want to take this as a next step. Do you have any suggestions (no samples) to what this exam might entail, I get that it’s dedicated to the front-end but does it include such factors as local.xml? Also will this test still be relevant once Magento 2 is officially released? You are very helpful to send me the study guide, but I already have it. I understand. I advise you to download Study Guide here. http://www.magentocommerce.com/certification/ After you apply, you will get an email with a study guide. Link might not work, but check the URL and you will see the error. There are some sample questions there. Would you say some questions? Certification would lose its sense if you know the answers. We know that many people cheat, but that’s not fair to the ones that passed it fair and square. Don’t you agree? I’m glad to hear that guys attended and became first Magento Certified Front End Developers. Congratulations to Hrvoje and Vanja.